Pfc. Darrell L. Cornelius, son of Mr. and Mrs. S. F. Cornelius, graduated from Frederick High School; husband of the former Selma Jean Davenport. Entered the Marines in Dec. 1942, trained in Santa Ana, San Diego, Cal. 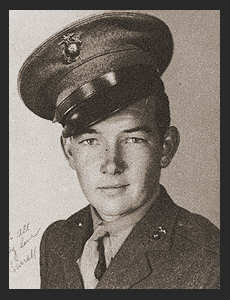 He served in Hawaii, Samoa, Tuni, Fuiti, the Marshalls; was discharged in Oct. 1945. Awarded four Battle Stars, Asiatic Pacific Ribbon, Am. Theatre Ribbon, Pres. Unit Citation, Bronze Star.